Singapore's ParkwayHealth is the first healthcare group in Southeast Asia to offer the In-Space percutaneous interspinous distraction device, a revolutionary spinal procedure. It is the bane of many elderly folk -- buttocks and lower back pain. 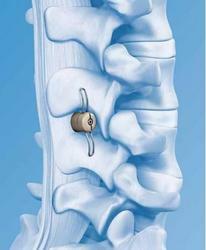 Also known as lumbar spinal stenosis, this is when spinal discs undergo wear and tear from natural degeneration. In the process, the spinal canals are narrowed and nerves may be impinged, causing the typical symptoms. To correct the problem, open surgery or a laminectomy may become necessary to distract the two vertebrae apart and decompress or release pressure on the nerve root. 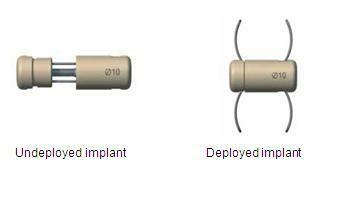 However, for suitable patients, a new procedure involving an implantable device is now available. Not only does it treat the symptoms with improved results but it spares the patient much discomfort and inconvenience. Developed in Munich, Germany in 2005 and launched in Europe a year later, the In-Space percutaneous interspinous distraction device was designed as a tissue-sparing alternative to the laminectomy. The former only requires a small incision of around 2cm compared to 10cm or bigger for the latter. With the aid of X-ray imaging, a wire is then guided to the space that needs to be widened or distracted. An implant (drum) is then railroaded between the affected spinous processes to widen the space between them. Specially-designed metal 'wings' help keep the implant in place by catching onto the adjacent vertebrae. Unlike a laminectomy, In-Space does not involve the removal of any bone and damaging of any muscles, thus ensuring that the stability of the spine is not compromised in any way. Since it is a minimally-invasive procedure, patients will not have to tolerate much pain, excessive bleeding, a long hospital stay, and invariably, enjoy a quicker return to work. Surgery for a single level of vertebrae with a traditional laminectomy would take approximately between two and three hours while the In-Space procedure takes just under an hour to complete. Dr Razmi Rahmat, Consultant Orthopaedic Surgeon at ParkwayHealth's Mount Elizabeth Hospital, is one of a few surgeons in Asia trained to do the procedure, the first of which was carried out in August 2008. "The most important thing is that this procedure is not done in the spinal canal, so the risk of nerve damage is negligible. There is no direct manipulation of the nerves. In fact, besides doing it accurately under image guidance, we are working very far away from the danger zones," maintains Dr Razmi. The suitable patients are usually those between 40 and 70 years of age displaying necessary lumbar spinal stenosis symptoms. Still, not everyone can present as an ideal candidate for In-Space. While leg and buttock pain is a common symptom, the patient needs to feel relief the moment he or she sits down. Dr Razmi explains, "This is a sign that the degeneration is not severe and is still in an early stage. If the pain is ever-present, then this won't work. A laminectomy will then be necessary to relieve the nerve. Still, I'm confident that although its applications are limited for now, more degenerative spinal conditions will in time, be treatable with In-Space." The In-Space percutaneous interspinous distraction procedure costs approximately US$10,000 for a single level of vertebrae done in Singapore. In the US, the procedure for use of the device is still awaiting approval from the Food and Drug Administration and is expected to cost at least twice as much as in Singapore.